Not The Barnet Times: Red Ken Talks Sense! Either I have turned into a swivel eyed Trot, or Ken Livingstone is a closet Tory! 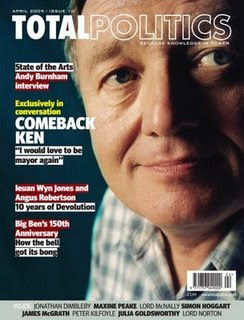 Iain Dale has interviewed Cuddly Ken for the latest issue of Total Politics magazine and it is well worth reading. Here is an extract, taken from Iain Dale’s Diary. Iain Dale: What would your advice to David Cameron be? Ken Livingstone: I think he has already made the fatal mistake which will sink his government. He’s not really going to devolve power away from Whitehall. He’s already told local government there will be no great change or shift in power. He’ll try to run all the schools from the centre. When they talk about localism it’s a sham. Neither this government, nor a Cameron one will empower people. Labour’s real mistake was to micro-manage everything and try to run everything from the centre. Nowhere else in the world does this work. If Cameron had any sense he would devolve about half of what Whitehall does to regional and local government, but he doesn’t believe in regional government. But you can understand it – all those years in opposition waiting for power. When you get it, it’s very difficult to give it up. What I discovered when I became leader of the GLC was that previously everything crossed the leader’s desk. The senior civil servants, like Treasury civil servants worked to the leader, blocking off their committee chairs. At my first meeting with the director general, I said ‘I do not want any officer coming to see me other than the director of finance or yourself’. They should work to the committee chairs we have appointed. Immediately, all these things were happening. If it had all had to come across my desk, half of it would never have happened. Although there will be mistakes, a real, massive devolution would start bringing good people back into local government, but there’s got to be financial change as well. 97 per cent of all tax collected in Britain is collected by Gordon Brown. When I told the Mayor of Moscow that he said: “That’s worse than Russia under Stalin”. From the moment Thatcher got power everything was sucked up to the centre and it got worse under Blair and Brown. Civil servants try to keep ministers busy with endless meetings and trivia. Iain Dale: Perhaps you should go and talk to Cameron’s implementation team. Ken Livingstone: Whatever he thinks of my policies, the main lesson Cameron should draw from my time is that if I made a decision it was carried out, and carried out quickly. The civil service is a malignant conspiracy against the national interest. A cabinet minister is the executive head of the department, able to remove the entire top tier. They probably couldn’t bring in a Bob Kiley figure from outside, like I did. When I took over we removed 27 of the top 30 people in London Transport. A government minister can’t do that. It’s tragic. The civil service is filled with crap. I met a government minister every week for eight years. There were a handful who were in charge. Ed Balls obviously was, because he was backed up by Mr Big. The one who impressed me was John Spellar. He and I had fought viciously from opposite wings of the party, but I had loads of meetings with Transport civil servants and they always expected him to endorse their position. When he said: “I agree with the Mayor on this” they were shocked. I saw government ministers read the brief which had been prepared for them and on one occasion I told the minister: “Your civil servants are lying to you” and I demonstrated why. They didn’t have an answer. The tragedy is that everyone below Cabinet level knows that the Permanent Secretary in their department does an annual assessment of their performance and sends it to the Chief Whip. It should be the other way around. They know if they go out on a limb, the civil servants will undermine them. Even if you’re John Prescott and all else fails, they’ll bring the Treasury in, or the lawyers to tell you you can’t do something. We’ve just got to break this. The civil service has its own agenda. In the end most ministers and most prime ministers go native and get sucked in by it. This is powerful stuff by Ken. He must have read The Plan by Conservative MP Douglas Carswell. Whatever you think of Ken, he's spot on here. I hope that Cameron does listen, because until someone does, we are in the doo doo. Having just read the new Barnet CEO's first public words, just reemphasised this. The one thing I've learned about politics is that you should nick your opponents best ideas. DC would do well to nick Ken's. Note Ken’s first sentence above: I think he has already made the fatal mistake which will sink his government. So Ken Livingstone admits that Labour will loose the next election!